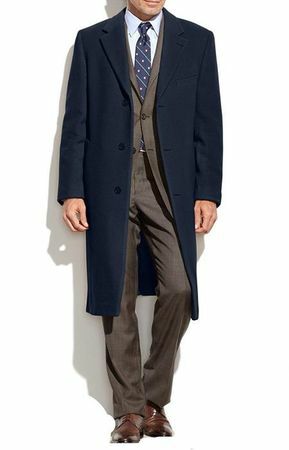 When the weather turns to fall and winter, it's time to really shine in public when you put on your navy blue knee length wool overcoat with a Cashmere Touch. I see too many men completely ignoring Top Coat when they are dressed wearing their suits. First and foremost when it's cold outside you need to wear a Top Coat over your suit. You need to be warm and stay healthy. Second, wearing a mens Knee Length Top Coat is extremely stylish and one of the most eye catching looks around. Nothing looks more sophisticated and put together than wearing your suit with your ankle length Top Coat on top.